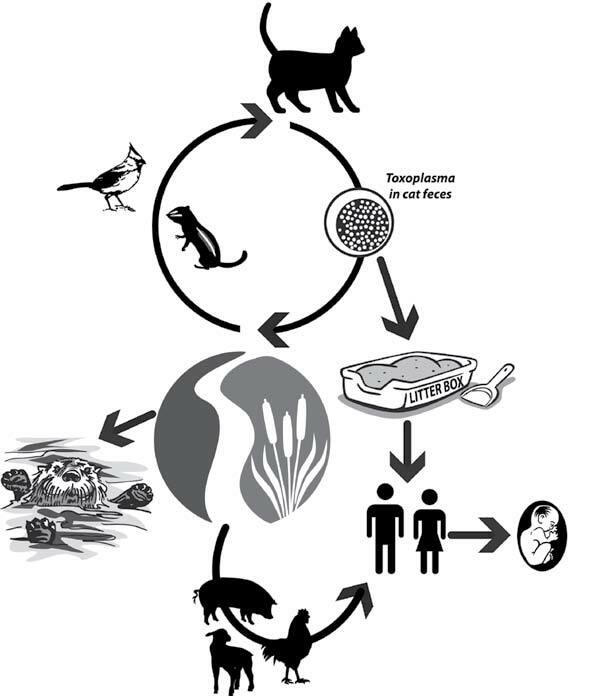 Toxoplasma (Toxoplasma gondii) is a tiny parasite that infects people as well as birds and other animals. Only cats and other members of the cat family shed Toxoplasma in their feces. Cats may shed the parasite in their feces for 7-21 days the first time they get infected with Toxoplasma. 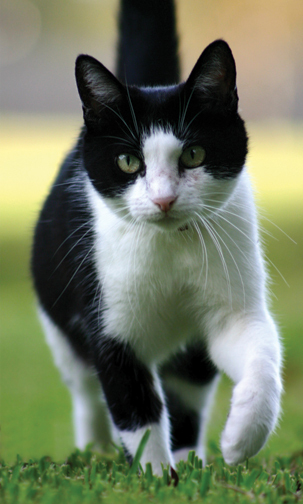 If they are allowed outside, pet cats can get infected when they catch and eat wild animals. Toxoplasma can be found in the feces of pets and stray cats, bobcats, as well as mountain lions. Parasites spread throughout the body to places like the lung, eye and brain in cats and people, and remain in the body for a long time. How do cats and people become infected? • Eating the parasite in raw or undercooked meat, mussels and oysters. • Eating dirt that has Toxoplasma in it either by not washing hands or by not washing fruits and vegetables. • Not washing hands after cleaning the cat box. • Drinking water that contains Toxoplasma. Babies can be born with toxoplasmosis if their mothers were infected while they were pregnant. illnesses. In these cases the body’s defenses may not be able to control the spread of Toxoplasma, and the parasites may cause brain disease. Severe consequences may occur in babies born to a mother who was infected while pregnant, including birth defects, blindness and brain damage. Pregnant women who are infected are also at risk of miscarriage. If you think you have been exposed to Toxoplasma, especially if you are pregnant, talk to your doctor. Eat only well-cooked meat and drink only safe (non-contaminated) water. Wash your hands well after any exposure to soil (gardening), sandboxes, or raw meat. Wash fresh fruits and vegetables to reduce soil contamination. Cover sandboxes and play areas to prevent wildlife and stray cats from contaminating these areas. Keep cats indoors to minimize their risk of infection. Feed cats only commercial cat food or well-cooked meat. Choose adult cats as pets. Have a spouse, partner or friend change the litter box. If changing the litter is unavoidable, wear gloves and change it daily. Be certain to wash hands well after changing the litter. Pick up cat feces from the yard daily. Take your cat to the veterinarian regularly and have your cat tested for parasites at least yearly. Keep water going to sewage treatment plants or septic systems Toxoplasma free. Sewage treatment may not kill Toxoplasma in cat feces. Throwing cat feces or litter down the toilet or outdoors could allow more Toxoplasma parasites to get into our rivers and oceans, putting wildlife at risk of infection, including sea otters. Put cat feces in plastic bags for disposal in a sanitary landfill. Remove cat feces from your yard. Toxoplasma lives for months in soil and can be carried over long distances in water. 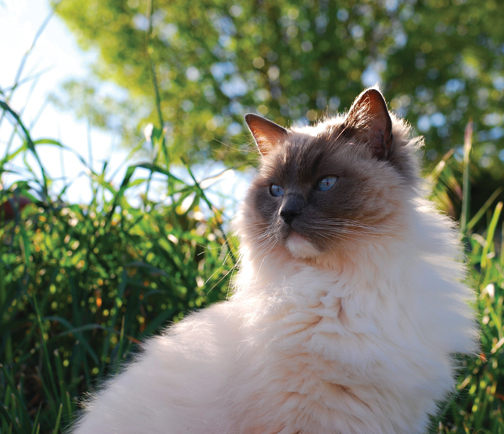 Following these guidelines will help prevent Toxoplasma infections in cats, people and wildlife.